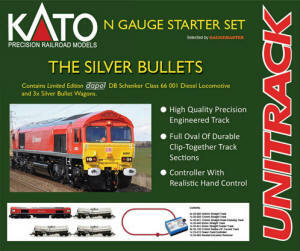 Containing Kato N Gauge Unitrack and a Limited Edition Dapol locomotive and rolling stock, this set combines the high quality engineering and durable reusability of Unitrack with British Outline stock. �Dapol Limited Edition DB Schenker Class 66 001 Diesel Locomotive and three Silver Bullet Wagons. The �Silver Bullets� are one of the few iconic freight trains still running in the United Kingdom. Containing china clay used for the production of lightweight coated paper for magazines, catalogues and brochures, this traffic flow runs from either Antwerp Docks in Belgium where imported Brazilian china clay slurry (kaolin) is loaded, or from Burngullow in Cornwall to UPM-Kymmene�s Caledonian Paper Mill in Irvine � one of the UK�s longest continuous freight hauls.